This Mexican street corn off the cob reminds me of Anthony Bourdain’s ability to transport you to another country and to try something new. They say you can mourn someone you’ve never met before and I truly believe that after this weekend. I know it may seem silly to mourn a “celebrity’s death” but I think any death is sad, especially one that’s untimely and one that leaves you with hundreds of questions. I feel that even though Anthony Bourdain was a celebrity, above all, he was human. I’ve never met the guy but I did watch a lot of his shows and his storytelling was captivating. It transported you to each location and I felt that after each episode, I yearned for more and I had a desire to travel. If I were to sort out my feelings over this, I think it affects me a lot because he was an inspiration to me. Traveling for food, learning about one’s culture through food — that is what inspires Jason and I to travel and that is what Anthony did. He literally went to every country with no judgement and truly wanted to learn. I hope we all learn from this tragic event and carry on his spirit by exploring the world, being bold with food, and knowing to seek out help when you need it or reaching out to someone if you think they need it. 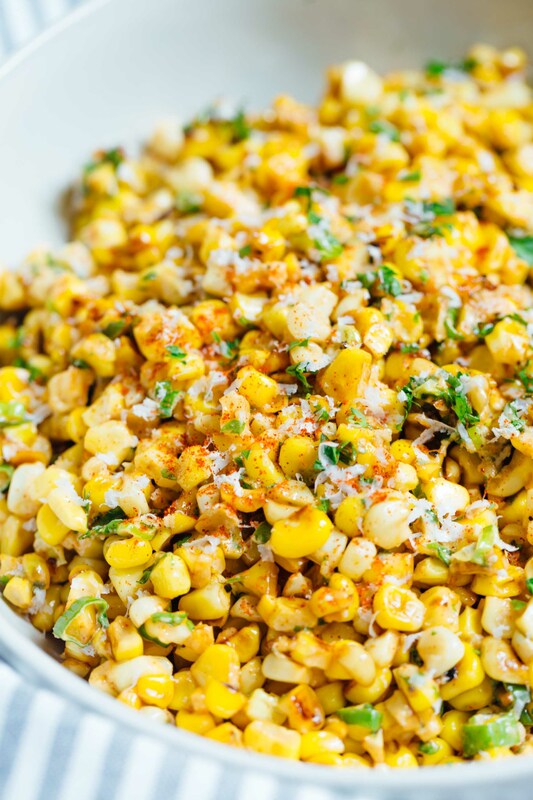 I have been pining to make this Mexican street corn off the cob since last year. I mean, I know it’s totally fine but I really hate it because 1. it’s messy and 2. you get so much stuck between your teeth and if you don’t carry floss or toothpicks with you, it can get real annoying! There are some restaurants apparently that if you ask, they will cut the corn off the cob for you when you order Mexican street corn. So that got me thinking…then why not just make the entire dish IN a bowl OFF the cob in the first place?! Well, that is exactly what I did and I could’ve eaten this ENTIRE bowl. It’s incredibly easy to make and has loads of flavor. The best part? 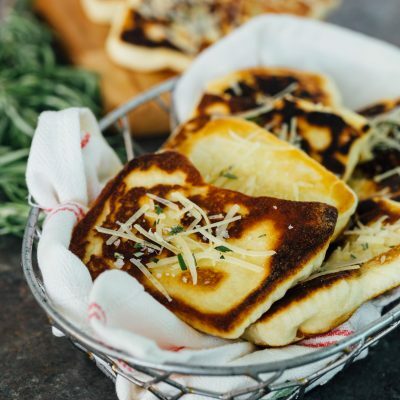 Your face won’t be covered in cheese, mayo, or corn. 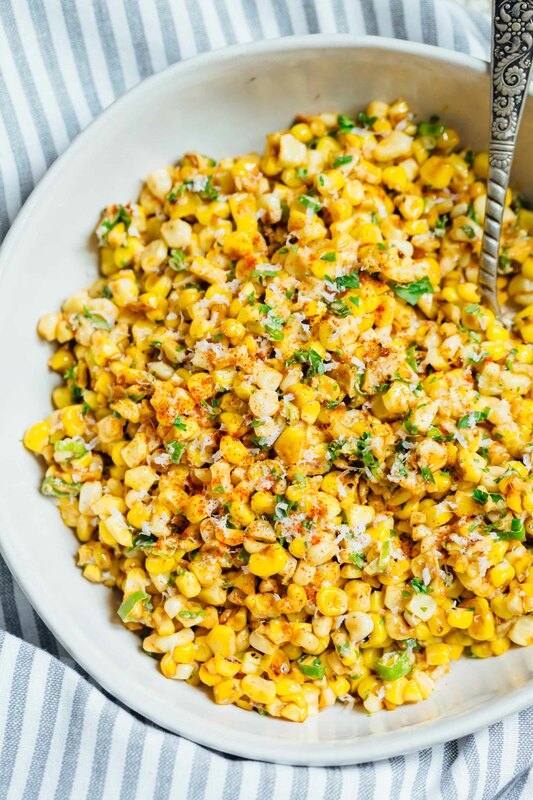 However, I guess if you are all about the experience, you could make this on the cob too but I like it in a big bowl because it’s easier to divide up and share as a side dish! Yes, just thaw it and make sure it’s warm (microwave or stovetop). Can I grill the corn on the cob first? Yes! That’d be so good. I think it tastes like soap. Can I use vegan mayo? You can use whatever mayo you want. You can do either but it’s best warm! You can keep it in the refrigerator for up to three days. I think this is best eaten as quickly as possible and I’m sure you won’t have trouble with that! 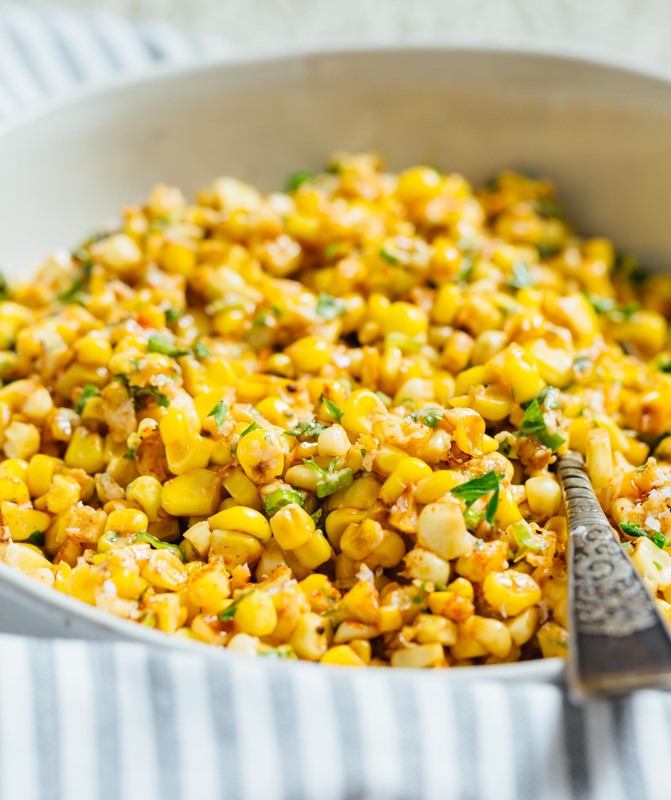 This Mexican street corn would be great to serve with a summer panzanella, grilled lime butter shrimp, or these grilled chicken kebobs! 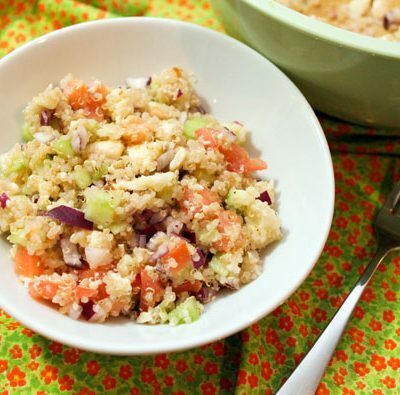 A much less messier way to have your favorite side dish! 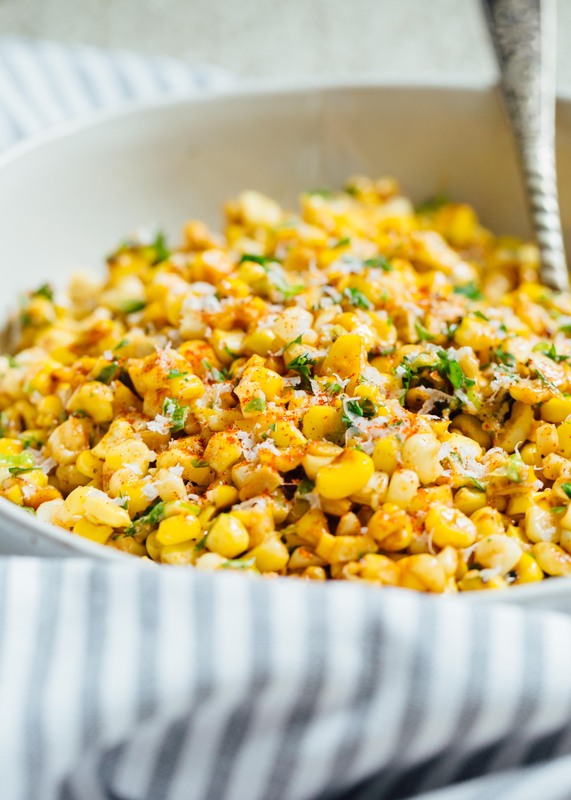 Mexican street corn off the cob tastes just as great as the 'on the cob' version! 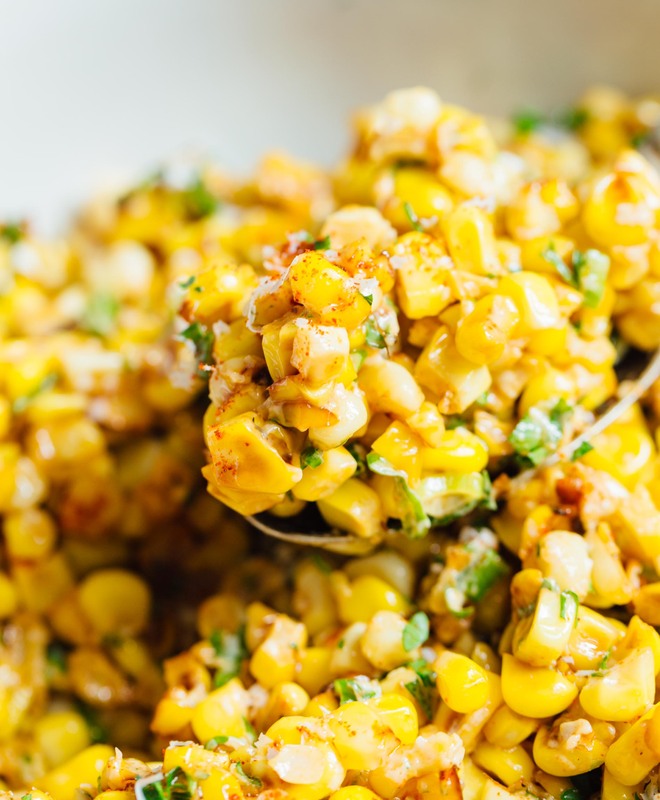 In a cast iron skillet, melt butter over medium-high heat then add the corn kernels. Spread in an even layer and cook for 10-15 minutes, or until exterior is charred/browned, stirring frequently. Be careful of the popping action of the heated kernels! Once charred/browned, place into a large bowl then mix in mayo, cotija, paprika, green onion, parsley, salt, and pepper. Mix to combine then divide evenly and serve! I love corn but I haven’t found eating corn on the cob enjoyable since I had braces as a kid. I am one of the few people who hasn’t been able to enjoy Mexican Corn on the Cob for that very reason so this is the perfect solution. I can’t wait to whip this up for dinner one night with a grilled steak or chicken. I’m excited! I don’t think it’s silly at all to mourn a celebrity’s death. You feel like you get to know someone, even if you didn’t get to know them in person. I so hear you! Do you guys have feta over there? I made this today and swapped out the cotija for goat cheese and the parsley for cilantro. (just what was available to me) AND IT WAS PHENOMENAL!! Yay! Yes, cilantro is PERFECT in this dish but since cilantro tastes like soap to me (darn genes! ), I usually sub in parsley for anything that uses cilantro. So excited to try this. Growing up my best friends grandpa would make Mexican street corn. For the picky eaters he would use the parmesan cheese in the shaker. I love it both ways but will probably make it using parmesan tonight due to living in an area that charges a kidney for cojita. Enjoy! bummer about the cotija though!! I just made this to go with fajitas and black beans for our Fajita Friday. It smells SO GOOD!! 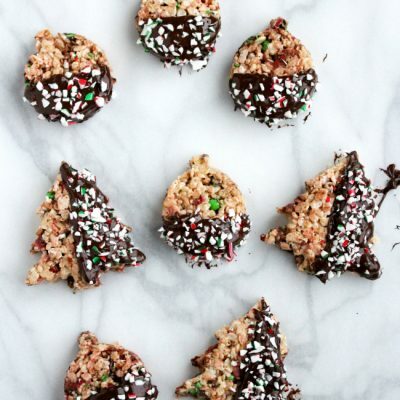 We can’t wait to dig in to it! Yum!! That sounds like a great pairing! 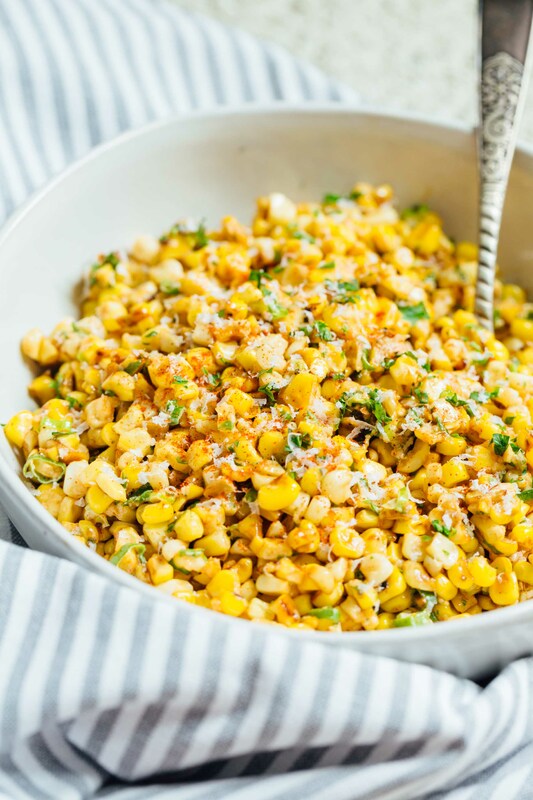 Your dish looks amazing i am going out on a limb i am willing yo mix the corn with hominey since they are related and i just bet the flavor will be amazing. Ooo yes, hominy would be amazing in this too! I LOVE hominy!